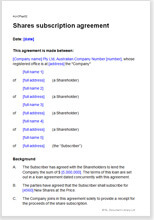 This agreement provides the same protection to the subscriber as you would expect if the whole company were being bought outright. You have the benefit of 127 warranties (less what you decide to edit out). The penalty reduction of balance due by you is calculated by reference to a simple, flexible formula. The framework of the deal is the Corporations Act 2001. Within that framework, there are no special requirements as to what your deal should be. Warranties - select from 127, in neat, sensible categories for you to choose and use. "Great repository of legal templates to get started in business - easily."